Designed for convenient CCD imaging. The device has a 1.25" nosepiece, threaded for standard filters on one end, which is inserted into a telescope's focuser, and an M42x0.75 T-mount thread on the other end to connect a suitable CCD camera. 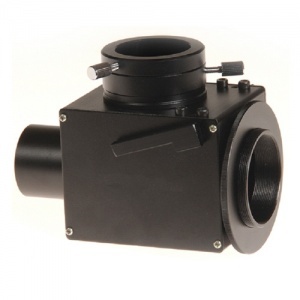 A 1.25" helical focusing eyepiece tube is provided for visual observations. In visual mode, the internal lever-operated mirror is angled at 45 degrees to channel the light path to the eyepiece in order to easily focus and frame the image. In imaging mode, the mirror is taken out of the light path to direct the light path to the camera. Please note: Your focuser will require 80mm of additional inward focusing distance from the normal focusing position to compensate for the length of the unit. Has a 1.25" nosepiece, threaded for standard filters on one end, and an M42x0.75 T-mount thread on the other.